Well, newly appointed MOCA curator Jeffrey Deitch didn’t take all of our advice for reinvigorating Los Angeles’ museum scene, but he did pick a feel-good blockbuster for his first show. Deitch’s curatorial debut will feature the work of painter, photographer, and filmmaker Dennis Hopper, as curated by painter and filmmaker Julian Schnabel. 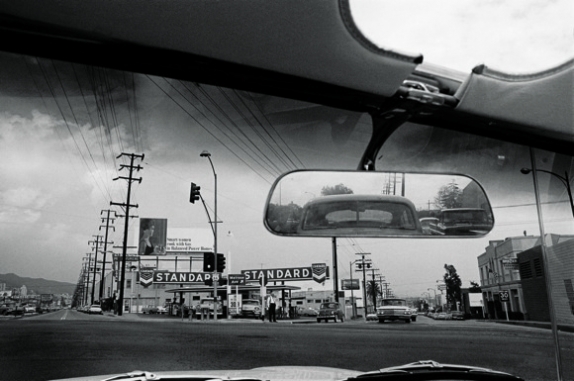 Hopper’s photographs of his Hollywood cronies and a rapidly transforming Los Angeles–like this one shot through the windshield of his car in 1961–were recently featured in the Taschen book Los Angeles: Portrait of a City and have been exhibited widely at galleries. In this video tour shot a few years ago of his own Venice Beach house, famously designed by Frank Gehry and filled with his iconic cardboard furniture, Hopper walks us through his personal collection, revealing a dizzying number of connections between his art and on-screen life. Prominently featured are works by Julian Schnabel, including a portrait of Hopper rendered in smashed plates. And there’s also a piece by Jean-Michel Basquiat, whose biopic was directed by Schnabel and starred Hopper as an art dealer. Hopper also says that he purchased an Andy Warhol soup can for $75 during the artist’s first show, which was in Los Angeles. He eventually photographed Warhol and starred in a Warhol film. the show to open July 11 to make sure he could be fully involved. Deitch even hinted that Gehry–an old friend–might be involved, and some site-specific installations will screen Hopper’s films like the landmark counterculture movie Easy Rider.